President Bernie Sanders: What Would it Mean? President Bernie Sanders! The very thought of such a thing gives many people hope for a better United States. It gives them hope that finally our country will be removed from the ruthless grip of the billionaire class who are making our society more and more brutally unequal. A President Bernie Sanders, many hope, will be a champion of ordinary people able to marshal the executive power of the federal government on the side of "We the People" for a change. What a wonderful thing THAT would be! Like a dream come true. But is it dream and merely wishful thinking, or is it really possible? I don't mean, Is it merely wishful thinking that Bernie Sanders could be elected president? Maybe he could be. I mean, Is it merely wishful thinking that a President Bernie Sanders would turn our country around from the awful direction it has been going and usher in a new era in which we begin heading towards equality and genuine democracy instead of the virtual dictatorship of the rich we've been suffering under for so long? Do We Live in a Democracy or an Oligarchy? To believe that it is not just wishful thinking but a real possibility, one would have to believe that the election system of government in the United States is truly what we are told it is. One would have to believe, in other words, that the election system allows ordinary American citizens, merely by flipping a lever in a ballot booth, to choose people to truly and genuinely represent them (and not Big Money) in the Oval Office and in Congress. One would need to believe that these representatives would then write laws that truly and genuinely represent the values--equality and mutual aid--of the ordinary people who elected them and not the opposite values of Big Money. And one would need to believe that the president in the Oval Office would then execute these good laws as the vast majority of ordinary Americans want them to be executed. But the reality is that we live in a dictatorship of the rich, in which the election system does not at all allow ordinary people to shape government policy. It's not just I claiming this. This is the conclusion of a widely cited academic paper reporting on a study with an enormous data base, online here and also here (Business Insider: "Major Study Finds the US is an Oligarchy") and here (TPM: "Princeton Study: US No Longer an Actual Democracy") and here (BBC: "Study: US Is an Oligarchy, Not a Democracy"). Additional proof is provided here. The history of elections in the United States, if one actually studies it, makes it virtually impossible to believe that the election system is what we are told it is. If one examines the promises made by elected presidents versus what they actually did in office (as I do for all U.S. presidents from FDR to Obama in my article here, which I hope you will read before deciding how much faith to put in the election system), then one sees that there is simply no correlation between the promises and the actual behavior of the promissor once in office. The promises are what most voters want. The actual policies pursued, once the candidate is elected, are always very different. This holds equally for Democratic Party and Republican Party presidents. The only president since FDR who in any serious way went against the policies favored by Big Money was JFK, and he was assassinated by (according to very persuasive scholarship) the CIA. The reason presidential candidates forget their campaign promises after being elected is not necessarily because they never intended to carry out their promises. Maybe they really do intend to do what they promise to do. (I think this is rare, but it can happen.) But whether the newly elected president wishes to honor his or her campaign promises or not, the reality is that he or she cannot do so if it means going against the will of the Billionaire class. The reality is that money is power, and the Billionaire class has the money. The policies of the federal government are determined by private organizations set up by and controlled by the Billionaire class. These are restricted-membership organizations such as the Council on Foreign Relations (in which foreign policy is worked out in meetings where what is said by anybody is officially never revealed to the public, and from which organization practically all the top executives involved in implementing foreign policy come, no matter who is president) and the Committee for Economic Development (where domestic policy is worked out, for example market-driven health care, as described in this article) whose "members are chairs, CEOs and senior executives of major corporations; university and college presidents; former corporate leaders; and leaders of prominent NGOs.") There are other similar "think tank" organizations, such as the Trilateral Commission and the Brookings Institute, which, like the others, limit who may join them, and exercise enormous influence because they represent the billionaires. The Council on Foreign Relations was set up by the Rockefeller family and David Rockefeller later on founded the Trilateral Commission. Not only is our government a dictatorship of the rich, but our whole society is also. Most Americans have to work for somebody else, as their "hired hand," and do what the boss orders them to do or else be fired. The boss in many cases is the section of the very wealthy class that owns the corporation one works for. There is not even a pretense of democracy "on the job." In a real democracy, people at work would, as equals, democratically decide on shared goals and ways of achieving them. But in our dictatorship of the rich, the goal of work is decided by the people who own the company and their goal is generally to make themselves richer off the labor of the workers. In this sense, most Americans are "wage slaves." Those who do the hardest work in our society are the poorest, and those who do the easiest work in great luxury (in fancy office buildings and five star hotels) or who do no work at all (like Alice Walton) are the richest. This is how it is when money is power and most people have practically none while a few are billionaires. In order for a person, once elected to the presidency of the United States, to turn the country around and cause it to go in the direction opposite to the direction favored by the Billionaire class, the power of money would have to be rendered null. But the only thing that can do this is a fundamental social/economic/political revolution, carried out by literally hundreds of millions of people where they live and work, that aims EXPLICITLY to remove the rich from power and to render the power of money null by having no rich and no poor (a moneyless society, as described here.). Such a revolution is NOT a pipe dream; it is NOT just wishful thinking. In the years from 1936 to 1939 such a social revolution took place in half of Spain (it is called the Spanish Civil War in the text books, but it was actually an egalitarian revolution led mainly by anarchist, not Marxist, ideas.) An egalitarian revolution is indeed possible in the United States, because it is in fact what the vast majority of Americans would LOVE. The proof that most Americans would love such a revolution can be seen from the fact that when one actually asks random people on the street what they think about the idea of removing the rich from power to have real not fake democracy with no rich and no poor, they say it is a great idea. (To see videos of people on the street saying this, watch this video, and see other similar ones here). To make an egalitarian revolution requires building an egalitarian revolutionary movement, as discussed here. In order for people to build such a movement they need to know two important things: #1) that most Americans today already would love an egalitarian revolution to take place; and #2) that simply voting in an election cannot make an egalitarian revolution. The ruling class (the Billionaire class) works very hard to make sure that people do not know the #1 and #2 facts cited above. Regarding the #1 fact, the rulers use their control of the mass media and the alternative media (such as Democracy Now!) to make sure that Americans never see or hear their fellow Americans saying they would love to remove the rich from power to have real not fake democracy with no rich and no poor. Even though most Americans feel this way, their egalitarian revolutionary aspirations are rendered invisible to their fellow Americans by the mass and alernative media literally censoring them. As a result, most Americans feel that, in having revolutionary egalitarian aspirations, they are a hopelessly weak and small minority, and therefore it is pointless to even think about egalitarian revolution, never mind talk about it (and risk scorn) or act upon it. Given this hopelessness, people reluctantly "hold their nose" and vote for the "lesser evil." Regarding the #2 fact, the rulers use politicians making wonderful promises to keep people thinking that they can make the government do good things just by voting for this or that candidate for president. As long as people have faith in the fairy tale Big Lie that elections allow us to control the government, then they will be far less willing to do what it takes to build a mass revolutionary egalitarian movement. The angrier people are at the policies of the Billionaire class, the more radical and even revolutionary the promises of a politician must be in order to maintain people's faith in the election system. The question, therefore, is not whether one will vote for Bernie Sanders or not. The question is whether one will work to build an egalitarian revolutionary movement or not. But, let's be realististic. To the extent that one places one's hope in Bernie Sanders and the election system, and to the extent that one tells other people to place their hope in Bernie Sanders and the election system (i.e., campaign for him), then to that extent one is helping the ruling class prevent the growth of an egalitarian revolutionary movement--the only thing that can remove the Billionaire class from power. What about Bernie Sanders's Platform and Views? Up to now, I have not assumed anything negative about Bernie Sanders's personal integrity, because that is not the main issue in deciding whether or not to vote and campaign for him. But, even though it is not the main issue, it is an issue. So let's look at Bernie Sanders, the man and his platform and views. The most striking fact about Bernie Sanders is that he supports the Israeli government's policy of refusing to allow the Palestinian refugees (from the 78% of Palestine now known as Israel) to return to live in that part of Palestine from which they (or, now, their parents and grandparents) were violenty driven out in 1948 and again in 1967 (and are continuing to be driven out.) The Israeli government uses the violent removal of non-Jews from Israel to ensure that Jews will be a robust majority of the population inside Israel, on the specious grounds that Jews cannot live safely among non-Jews. What the Israeli government refers to as "the existence of Israel" and (the need to do whatever is necessary to protect) "the security of Israel" is code for the ethnic cleansing of non-Jews from 78% of Palestine. To see that this is so, it is only necessary to consider that if Israel ended the ethnic cleansing (by allowing the Palestinian refugees to return), made non-Jews and Jews equal under the law, and fairly compensated Palestinians for property stolen from them by the Israeli government (which would indeed mean the end of Israel as a "Jewish state"; so what? ), then the Palestinians would no longer have a grievance against Israel and the conflict would end and ordinary Jews inside Israel would be FAR safer than they are today. Even if some individual Palestinians continued to advocate violence against Jews, they would now be considered criminals by the vast majority of ordinary Palestinians, whose anger at Israel is anger against ethnic cleansing, not anti-Semitism. (Before the Zionist movment linked Judaism with ethnic cleansing, Jews and non-Jews in Palestine lived peaceably together, contrary to the Big Lie that Jews and Muslims in Palestine have been fighting for thousands of years.) But a just resolution of the conflict is the very last thing that Israeli and American rulers want. A just resolution of the conflict does not happen because both the Israeli and American ruling classes have a social-control strategic reason (Israel's ethnic cleansing creates the bogeyman enemy that their Orwellian Wars of social control need in order to work) for supporting Israel's brutally violent and decades-long ethnic cleansing, which reason I discuss in my articles titled "The Israel Lobby's Power Comes from the American Ruling Class" and "Israeli Leaders and Hamas Need Each Other." Every serious American politician, Jewish or not, supports Israel because they know that this is presently a condition for gaining the status of "serious politician" in the mass media controlled by the ruling class. Expressing support for Israel is the way a politician indicates to the ruling class that he or she is not REALLY trying to remove the ruling plutocracy (oligarchy) from power, no matter what else they may say on the campaign trail. When pressed at a town hall meeting to condemn Israel's ethnic cleansing (not just its "disproportionate" use of force in carrying it out) forthrightly, Sanders got angry, as reported here. "Israel-Palestine The Senate last week passed a resolution without a formal roll call vote by unanimous consent supporting Israel’s right to defend itself against rocket attacks from Hamas. Writing for Salon, David Palumbo-Liu noted that Sen. Sanders “voted” for the resolution which actually passed without a vote. LINK"
"For many outside the U.S. Senate, the discovery that even progressive stalwarts such as Bernie Sanders, I-Vermont, Elizabeth Warren, D-Mass., and Al Franken, D-Minn., voted for the resolution is more than disappointing. It does more than confirm U.S. Senate support for Israel. It pushes that statement beyond any rational or ethical or moral framework imaginable. "The resolution not only gave the green light to the invasion—it gave the IDF a high-five and armaments as they crossed the intersection. All this after more than 400 civilians already had been killed by Israeli forces, the vast majority of them children. It was as if that bloodshed were not of a sufficient quantity." On domestic issues, Bernie Sanders, despite whatever he means by calling himself a democratic socialist, absolutely does not say that the rich should be removed from power. On the contrary, he says that they should ease up on how terribly they treat regular people. One can examine Sanders's own websites and never find even a hint that the rich should be deprived of the power that they have as a result of personally owning (illigitimately!) billions of dollars of wealth. Nothing that Bernie Sanders advocates would change the fact that Americans would remain wage slaves, working for a wealthy class as their "hired hands" with no say over the goals of their work (for example, to make "guns or butter"). Yes, Sanders advocates "Getting Big Money Out of Politics." But this is eyewash. Campaign finance legislation--no matter how "stiff"--will never remove the rich from power because such legislation does not remove the rich from their money. Here's why removing the rich from their money (i.e., having a society not based on money) is so important. The power of the billionaire class comes from their billions of dollars and the fact that in our society money is power. Money is the power to buy and control newspapers and radio stations, and determine whether or not they report that Joe Shmoe is a serious and responsible politician or a lunatic dangerous kook. Money is the power to offer a senator (or senator's spouse or child or friend) a cushy job or not, depending on how loyal a friend the senator is. Money is the power to tell a community that if it doesn't provide a sweetheart tax break to a corporation then the corporation will leave town and the community will lose jobs. Money is the power that enables billionaires like Bill and Melinda Gates to determine how our children will be treated in our public schools, specifically how the poorest and most working class children will be abused and told (with high stakes standardized tests that give the poorest and most working class children the low scores) that they are not deserving of a good-paying job. And the list goes on and on. Writing a law that limits how much money somebody can donate to a campaign may help to disguise the dictatorship of the rich, but it does not diminish its power. Why Is the "Democratic Socialist" Sanders Portrayed So Respectfully in the Capitalist Media? Bernie Sanders is calling for some things that Americans want very much, such as medicare for all. Why does the ruling class let him do this and still treat him respectfully in their capitalist-owned mass media? American history suggests why. The fact that at one point a majority of Americans supported the Occupy Wall Street movement, and other similar facts, have made something very clear to the American ruling class. The rulers now realize that in order to prevent the growing numbers of dissaffected Americans from starting to think that it is necessary to make an egalitarian revolution, there need to be at least some politicians who, in their rhetoric and promises, address the concerns of these Americans. That is why almost all politicians today, as never before, talk about the problem of inequality. They need to do this in order to maintain "street cred." They need to do this in order to keep people from deciding that elections are just a hoax and revolution is necessary. The more disillusioned with the system and angry at the Billionaire class Americans get, the more radical and revolutionary the politicians' rhetoric and promises need to be. At the same time, these politicians (if they wish to maintain their good standing in the mass media) need to be only as radical as necessary, but no more so. 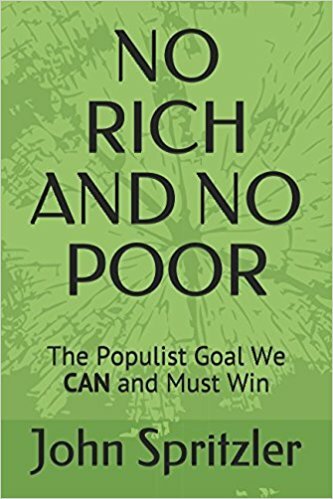 This perhaps explains why Bernie Sanders advocates things like medicare for all, and in general says the rich should ease up on people, but does not call for building an egalitarian revolutionary movement to remove the rich from power and have no rich and no poor. At this time, his "radical-lite" rhetoric is judged sufficient to keep people believing in the election system. If there ever is a President Bernie Sanders, all of the evidence indicates that within a few years the people who voted for him will be as angry at him and regretful of being decieved by him as people who voted for Barack Obama are today angry at him and regretful of being deceived by him. Because the fundamental role of the federal government will continue to be to serve the Billionaire class, its policies will continue to anger most people, despite the presence of a Bernie Sanders in the Oval Office. The choice for Americans will remain what it has always been: either suffer to live as wage slaves*** in a dictatorship of the rich that gives a bit more one day only to take it back the next****, or make an egalitarian revolution to live as free and equal citizens in a genuine democracy. * This video shows Bernie Sanders answering a question about Israel. Sanders makes it clear that he has the same view about Israel that Barack Obama has and, for that matter, that George W. Bush and George H. W. Bush had, which is that Israel should stop expanding its settlements in the West Bank in order to make possible a "two-state solution." The "two-state solution" means flat-out denial of the Right of Return of the Palestinian refugees to the 78% of Palestine known today as Israel. The denial of this right is far and away the #1 grievance of the Palestinians. Refusing to grant the Right of Return means perpetuating the conflict at its root by continuing the ethnic cleansing of non-Jews from 78% of Palestine. *** "How the Unions Killed the Working Class Movement" discusses how a real "political revolution" (Bernie Sander's new rhetorical phrase) is about ending wage slavery, not getting a higher minimum wage. **** Whenever the Billionaire class has made concessions to popular demands by people "in the streets" in order to stave off the growth of a more revolutionary movement, it has always used its power to take back what it gave, in one way or another. For example, the rulers yielded to the 1960s Civil Rights Movement and abolished Jim Crow (overtly racist) laws, only to institute the "New Jim Crow" of racist incarceration, as discussed here. The rulers yielded to the earlier huge labor strikes (like the great Flint Sit-Down Strike) in the 1930s demanding the right to have labor unions, only to turn the unions into agents of the employers to control the workers, as discussed here. The rulers yielded to the 19th century battles of workers for the 8 Hour Day, only to lower wages and force many Americans to work (often in two jobs) more than 8 hours and also to force both parents to work in the waged labor force when previously only one could support the family by doing wage labor. This is why we need to remove the Billionaire class from power, not just win this or that reform.